For those of us who grew up reading print comics from the newsstand or the comic shop, but have since then witnessed the birth of digital comics, we may feel we have seen major changes in the landscape of comic publishing. We would not be wrong to think so, and the developments that we have gradually embraced in comics form a continuum that may yet lead to changes far beyond our current imaginative climate. However, the shifts that occurred in both the method of creating comics and in publishing in the decades before many of us were part of the comics conversation were so wide-ranging and astonishing in their impact that it is hard for more youthful readers to fully grasp those seismic shifts now. And yet those very shifts created the continental drifts that led to the current changes we still witness. Conceptually, comics became community-driven in the hands of self-publishers like Wendy and Richard Pini, the creators of ElfQuest, long before the dawn of fan-driven webcomics or crowdfunding platforms. No doubt books will be written on the ways in which ElfQuest, and self-published comics that followed ElfQuest’s example, blazed remarkable trails in fan engagement. This is particularly likely now that the Pinis have generously donated a wealth of original art and supporting documents as an ElfQuest archive to the library at Columbia University. The size of the donation itself, and Columbia’s delight in receiving it, suggest just how significant comics historians know ElfQuest to be, and what potential for research and discussion lies ahead. The unlikelihood of ElfQuest ever coming into existence as we know it was, however, profound. All it would have taken would have been a momentary hesitation from the Pinis when their first ElfQuest story appeared in an indie comics magazine printed on sub-standard materials, only for that publisher to promptly go out of business. They could have taken that as a sign to move on and try some other endeavor less precarious, less potentially disappointing, than comics. But instead, they didn’t simply take the series to another publisher, but sat down and conceived of a superior way to present the material, geared toward aesthetic values and a rich reading experience for the audience. Taking matters one step further, they self-published that material, a decisive act that set them on a path which is still unfolding forty years later. Trying to pin down the alchemy of appeal in the comic series itself will leave you certain of its raptor-like ability to seize the reader’s attention, but perhaps even less able to single out just one particular quality that makes it shine. But if you open a book like The Complete ElfQuest Volume 1, which takes you back in crisp clarity to the “Original Quest” and earliest ElfQuest stories, you will be immediately struck by Wendy Pini’s art style and the intense use of page space for layered narrative. You’ll also notice the manga-like visual focus on the emotional state of the comic’s characters, as well as the more general mood of each panel. It’s no exaggeration to say that a single panel is often capable of conveying a whole world in ElfQuest. And yet this is a book that transmits thousands of years of alternate history for its star-traveling and shipwrecked elves, the splintered clans that result from their crash-landing in pre-history, and in particular, the life and times of the Wolfriders. This is a story world that plays out on both the large scale and the small scale, and suggests that both have virtually equal emotional weight in the narrative. Central characters Cutter and Skywise immediately enable the reader to grasp the intense personal lives of the elves, and the procession of long periods of time and vast distances in space enable the reader to grasp their cultural and historical context in ways that we may wish we could grasp our own. The Pinis built upon these original core elements to establish an astonishingly wide cast of characters, times, and places. It is hard to conceive of a more expansive story universe in the realms of science fiction or fantasy than the Pinis have created through attention to their original architecture. Their ability to build ElfQuest has been just as impressive as their ability has been to reach readers outside of mainstream distribution. Of course, prior to the Pinis, there had been other comic creators who discovered that self-publication can reach readers, and their lessons learned no doubt empowered ElfQuest to come into being in the same way that ElfQuest has since then empowered many comics in the digital comics generation to reach out to their own fanbases. But innovation is often found, not only in the tools we use, but in how we use them. With ElfQuest, the Pinis essentially took a model previously associated with underground comix and applied the verve and self-determination of that movement to an entirely new mode of storytelling. Their new mode was genre-blending fantasy that would parallel the interests of the mainstream comics industry and, even more closely, the interests of the mainstream prose fiction market. Somewhere at the intersection of the two, ElfQuest would not only become a monumental success story, but usher several generations of fantasy fans into the realm of comics readership, too. In retrospect, what Wendy and Richard Pini did contained plenty of common sense, but it also reflected very specific personal aesthetics that the Pinis expanded into in the hopes of creating a superior reading experience. They took their story and blew it up into magazine format, created a full-color glossy cover for it, and provided extra character portraits on the back covers. They created their story on substantial paper stock that would do justice to the lavish inking and make reading the script elements sharper and clearer. That paved the way for readers to encounter the Pinis’ story as a more opulent experience of the fantastic. As ElfQuest grew, and as readers, holding this superior quality of book in their hands, experienced the unique world and universe the Pinis had artfully created for them, people were, quite simply, hooked. The Pinis had created a new product in a new format that appealed to the senses, the emotions, and a desire for community among readers. Only as the comic became increasingly successful did other potential self-publishers take note of this emerging fandom as a developing marketplace. ElfQuest soon garnered interest from publishers, but the Pinis decided to only work with publishers on the collected editions, and not on the creation of the stories themselves for many years. This effectively reduced the influence of outside sensibilities on the creation of characters and storylines and shored up the original feel of ElfQuest to an even greater degree. However, the Pinis were not without their own organizational structures for production. They have spoken in the past about Richard’s role as editor and co-scripter in the creation of ElfQuest, and little insights like these help unlock the mysteries of the comic’s success.When Richard and Wendy co-scripted each issue of their comic, they produced a back-and-forth typical of editorial process. When Richard quite literally took out a pen and trimmed and reconfigured dialog, he brought an internal awareness of process to the series that kept the reader in mind and focused on a specific goal: the greatest possible quality in the final product. If the Pinis are beginning to sound both like business people and a two-person publishing house, that is because they pioneered both personas for comic creators seeking to publish and distribute their own work. If that sounds unromantic compared to the alluring, and often extravagantly beautiful stories that Wendy and Richard tell, ask yourself: What could be more romantic than producing an experience with readers so firmly in mind that stories arrive regularly for them in high-quality format? Nothing takes a reader as directly out of the world of a comics story than the conditions under which they are read. The Pinis fine-tuned those conditions as carefully as they crafted their stories. Over the years, the Pinis would have to become even more firmly entrenched as business people in running their own publishing house. It is hard to conceive of any other independently created property that, in continuing to publish new work across four decades, was obliged to make deals with several major publishers for collected and remastered editions. From Marvel Comics, to DC Comics, and finally, to Dark Horse for new stories, collection and distribution, few creative teams have had such an intense experience of learning just how creator-owned properties can have mutually beneficial relationships with publishers. But that task has not been thankless for the Pinis. The response from fans has always been what has buoyed the series and inspired the Pinis to continue their work. Developing into multi-media formats, from prose, to drama, to music, and more, the world of ElfQuest has proved highly versatile in inhabiting the imagination of its audience. 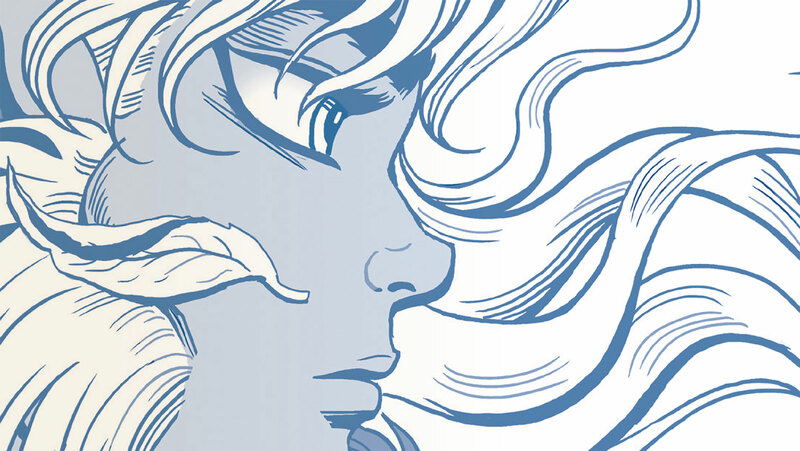 The existence of ElfQuest continues to support the idea that creative people can craft new ways of thinking, as well as new ways of storytelling, and when released on the world, those innovations can find a community who will benefit from them. ElfQuest found a tribe in the days before crowdfunding, before webcomics, and before the rise of all-access digital platforms. And it managed to adapt new methods in order to reach readers over a swath of publishing history very few properties can boast. As such, it represents the power of like-minded communities to find each other through the stories they tell.